I read this article and found it very interesting, thought it might be something for you. The article is called Rural Wage Growth Plunges To 10-year Low and is located at https://archive.indiaspend.com/cover-story/rural-wage-growth-plunges-to-10-year-low-25295. The wages of people living in rural India are no longer rising at the same rate as they were under the United Progressive Alliance government. Last week, The Indian Express reported that the average daily wage rate for rural India grew by 3.8% in November 2014 as compared to the same month the previous year. This is the lowest since 2005, said the paper. As recently as June, growth figures were in double digits. In 2011, growth rates were higher than 20%, the paper said. The decline in rural wage growth comes at a time when there is heightened concern over the cuts in government spending on the rural jobs programme under the Mahatma Gandhi National Rural Employment Guarantee Act (NREGA). Although the government has denied squeezing the scheme, data obtained by Scroll show that barring five states, all others have received significantly lower funds from the centre under the scheme this year as compared to last. Unless the government makes up the shortfall over the next three months before the end of the current financial year, it would constitute a large drop in the scheme’s funding, hitting hard millions of rural workers. 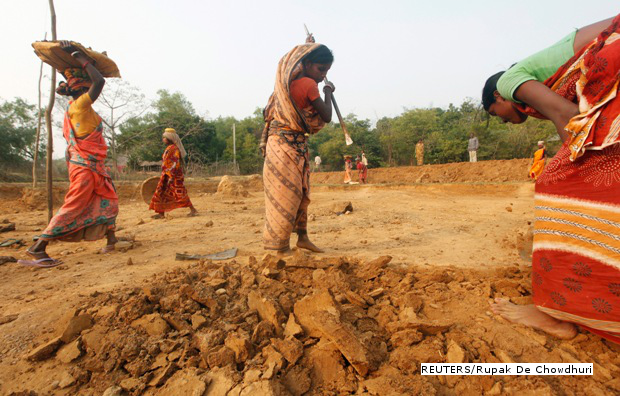 Could the cuts in NREGA spending explain the drop in rural wage growth? For one, it would be important to see wages in conjunction with prices to arrive at the “real” growth rate of wages as opposed to the “nominal” growth rate. Higher prices reduce the “real” value of wages. Inflation levels have come down in the last few months. During the years of high inflation, debate raged over whether government spending on NREGA contributed to rising prices as extra money in the hands of rural workers led to an increase in the demand for food and consumer goods without a simultaneous increase in supply. However, this phenomenon, called the wage-price spiral, was dismissed by Reserve Bank of India governor Raghuram Rajan. In August 2014, PTI reported that Rajan said the impact of NREGA on rural wages could not be higher than 10%. Rajan attributed the growth in rural wages to other factors like better returns from agriculture, the rise of the construction sector and the withdrawal of women from the workforce, which led to the shrinking of the available pool of labour. By this logic, the cuts in NREGA spending alone might not explain the dip in the growth rate of rural wages. The burre din (bad days) in rural India will not leave the rest of the economy untouched.